This 30th birthday cake was inspired by the fun prints of Lilly Pulitzer. It is Birthday Cake (yellow cake with sprinkles) with buttercream frosting. Unfortunately, I only took one picture on my phone when I finished the cake and forgot to take pictures with my real camera. 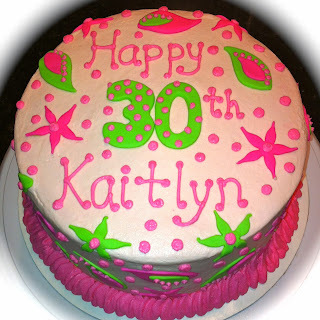 Oh well...Happy Birthday Kaitlyn!